This bank was on the west side of Front Street. The Milton Opera House was to the left, and the Riverside Hotel was to the right. The original bank was lost in the great fire of 1880. The picture at right (courtesy of George Venios) shows it just after the fire. From Bell’s History of Northumberland County 1891: The First National Bank of Milton - The charter of this institution was granted February 13, 1864, and extended February 24, 1883. The first officers were J. Woods Brown, president; S. D. Jordan, cashier, and J. Woods Brown, William McCleery, Samuel T. Brown, John Datesman, James P. Armstrong, William H. Marr, William Savidge, Harry Frick, and John Bower, directors. The directorate was increased to eleven members January 6, 1805. Mr. Brown died January 6, 1888, and H. A. Fonda was elected president January 18, 1888. Mr. Jordan died April 17, 1875, and J. M. Caldwell was elected cashier April 19, 1875. Mr. Caldwell, the first teller, was elected to that position, May 14, 1866; Thomas L. Wilson was elected as his successor April 19, 1875. Messrs. Fonda, Caldwell, and Wilson are president, cashier, and teller, respectively, at the present time. The original capital, eighty-five thousand nine hundred dollars, was increased January 28, 1876, to one hundred thousand. The first place of business was in the old Lawson building on Front street; the present banking house was erected in 1880. From the Standard Journal, Oct. 30, 2009: The bank rented space in two different buildings before moving to 42 S. Front St. in 1872, where space was rented in what was then known as the Huth Block. 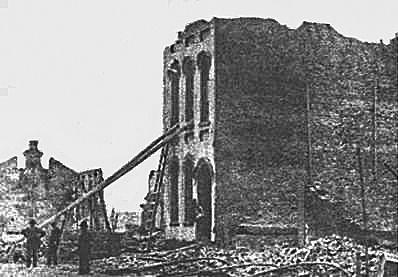 The Huth building, including the bank’s office space, was destroyed by a fire in December 1875, forcing the bank to relocate again to rented space across the street. The bank bought the burned-out Huth building after the fire and constructed its own bank building there, opening in July 1876. The building at 42 S. Front St. was destroyed in the Great Milton Fire on May 14, 1880. 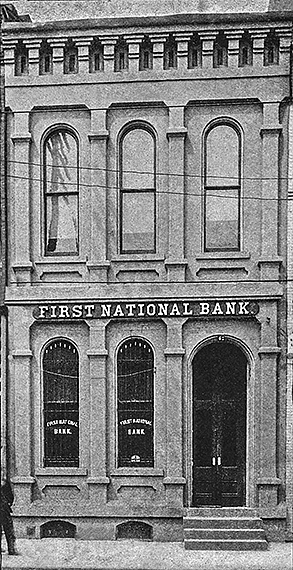 The bank immediately rebuilt at the same location and reopened there in November 1880.